Below is a diagram of my plan for each air drop. 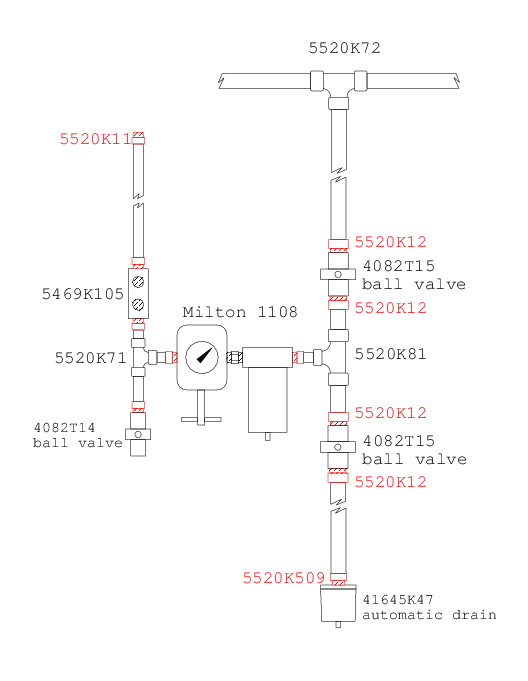 The part numbers in the diagram are McMaster-Carr part numbers, except for the Milton 1108 which I bought from Northern Tool. The main feeds are 3/4" copper, converting to 1/2" to pass through the filter and regulator before going to the manifold (5469K105) and on to a hose reel. I intend to have three air drops: one at the north end of the garage, one at the south end of the garage and one between the garage doors. I've purchased the following parts, but I'm not done. I still need to purchase the following parts.